The challenge of finding particular places easily has always preoccupied coders, and alleviating this quagmire has been central to Wasamundi.com. Founded by Qiuncy Kwende and Nara Laurence,Wasamundi connects people to information they care about, including local businesses and places in their community. It is a platform which assists people (especially students) find the accommodation of their choice via the web (Wasahostel.com) and SMS search. WasaHOSTEL (wasamundi.com/hostels or wasahostel.com) is a platform which helps university students find housing via a website and by SMS across the country. For example if a student is looking for a room which costs 250,000 francs (518 USD), they can use a mobile phone to text “Search 250,000” to 8047 (For MTN and Orange Cameroon Networks). The algorithm then selects hostels based on several unique variables like: how close is this hostel to the university? Is there a vacant room in this hostel? Is there a vacant room for the price which the student has searched? Wasamundi allows businesses to be rated by customers and also has an SMS platform (wasamundi.com/texto or wasatexto.com) which allows users to send single and bulk SMS worldwide for 10 francs (0.02 USD). 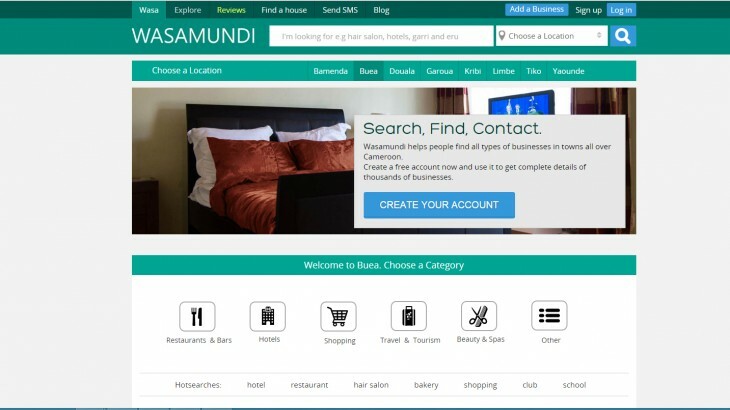 Its services cover the North, South West, Littoral and Centre regions of Cameroon, and Alexa.com ranks Wasamundi as the 121st most visited site in Cameroon. On top of all this, Wasamundi delivered the first URL shortener in Cameroon.